1. Write what you know. On the surface, this may sound like savvy advice. It’s not. With the advent of the Internet, we can do the research and find out almost anything. We're no longer limited to our own personal experience. 2. Write every day. Again, it sounds good. Surely someone who’s serious about something will do it every day. Truthfully, we all work better when we take time to relax and let our minds rest. 3. Never read what you’re writing. I’ve never found this to inhibit my output or the quality of my work. I’ve found that reading keeps the writing fire stoked. Just be sure you’re not reading instead of writing. 4. Write dialogue like you talk. We all want the dialogue we write to read like a real conversation. But the smart writer knows that means taking the boring parts out. Listen to a real conversation or better yet, record one. Then write it out. You’ll see how truly awful it is. 5. Never use clichés. 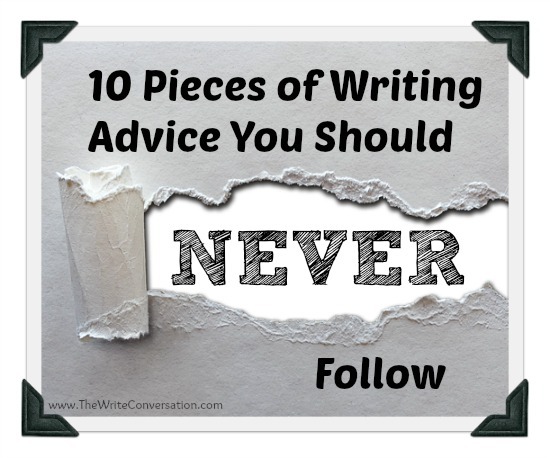 Never is NEVER good advice when it comes to writing. Sure you want to avoid clichés—in narrative. But the fact is, we all use them occasionally. Judiciously sprinkling them throughout dialogue can give your writing a familiar flavor that helps the reader connect with your characters. 6. Never use the verb was, it’s passive. Sometimes the word was is passive, sometimes is just past tense. How to tell? The quickest way is to see if it’s helping another verb, like, She was sleeping. That’s almost always passive. A better option would be, She slept. 7. Always outline before you write. Some people are known as plotters—or those who prefer to outline their story before writing. Others, referred to as pantsers or intuitive writers, like to discover the story as they write. The best way to do it? The way that works for you. 8. Real writers don’t have to do rewrites. I’ve never spoken to a writer who didn’t need to do rewriters. I’ve heard rumors, but I suspect I’m more likely to get an in-focus picture of a Sasquatch than meet one of those elusive novelists. 9. Always write in the same place. Most of us need variety, and that includes the place we work. Sometimes I write at my desk, others at the dining room table, and on good days, the screened porch out back. 10. Don’t begin to build a platform until you have a contract. This is the worst advice I’ve ever heard, and there are two major reasons. First, if you wait until you have a contract to build your platform, you’ll probably have a hard time getting said platform. Second, you will be way behind. It takes a good year to a year-and-a-half to build a viable platform. As you may have noticed, the first clue the advice you’re hearing is suspect are the use of the words ALWAYS and/or NEVER. Now it’s your turn, what’s the worst writing advice you’ve ever heard? Awesome, awesome, awesome piece, Edie! I was hooked as soon as I read #1 because I've had that one thrown at me before - a lot. I don't like blood and gore and have never struck or killed anyone or done drugs. In my books, my characters do. And occasionally they use a word or phrase I'd never say - but I enjoy researching and writing such. One of the worst pieces of advice I've received is to write at your most productive time. For me, that's several hours before daylight. Not always possible. Sometimes I write in whatever spurts I can find and get interruptions. Not ideal, but when I used to wait on ideal or optimal conditions, I was far less productive. I've found it's more important that I wear loose-fitting, comfortable clothes and no shoes and cut off the TV. The worst - or least helpful - advice I've received is to write now and revise later. I simply have not been able to do that, yet I've managed to produce 4 books and 25 anthologies. I hit spots where I revise all day before going forward. Love #1. I mean, really, what author has experienced or is even familiar with everything they write about, particularly fiction? While I do believe you should live what you teach as a Christian writer, I find learning about new things through research makes you a better writer. If I only write what I know, I'm not going to write very much! I love the challenge of researching scripture to address an issue. A lot of well-meaning advice is wrong or does not apply to all circumstances. Another great top ten list, Edie. Good advice, Edie. Or should I say, good advice to never follow. I'm thankful for your blog that helps us keep a good perspective on all things writing! Thanks so much. Very few things come under the heading "always/never" in this life. Edie: Again, another good message for us. Thank you for your efforts to educate us. I would like to make #10 on your list #1! Authors regularly contact me, saying, "My book is coming out [tomorrow / in one week / in one month]. I think I need to start building a platform. What should I do first?" I know that platform building and marketing isn't most authors' cup of tea, but it's essential if you want that book you worked so hard on to get seen, purchased, and read. I confess, sometimes I don't even admit I'm writing! It's to avoid the onslaught of unsolicited advice. The admission of being a writer is like having a newborn baby. You're going to get endless amounts of useless advice and you open the floodgates for unwanted criticism.That being said, I do take it too far, and I should at least admit it to fellow writers. We share the same struggles and battles. The worst advice I've ever heard was not to write about myself... I'm a bore. This came from one of my professors, and punctuated my soul. I'm still fighting that advice at times, since most of my writing is very personal. Most of my published works have the same glowing compliment about my wonderful transparency. Not writing about myself or my experiences can't co-exist with that transparency if I take myself out of the equation. So for anyone who reads this I encourage you to tell your stories, glean on your life experiences, and give the world your opinion on things. I still have to work on being bold. But as I was recently convicted by a dear friend, "God doesn't call us to have a spirit of timidity." I'm working on that.... I just have to believe in my calling.